Across the street from Ford’s Theatre and next to the Petersen House in Washington, D.C. there’s a museum dedicated to Abraham Lincoln’s legacy. The centerpiece of that museum is a three-and-a-half story tower of books written about the 16th president of the United States. Amongst the already massive historical studies of the American Civil War, Lincoln biographies and monographs stand above all else in number of studies done. Into that field of study comes a new book about the Lincoln Assassination—told not through Lincoln’s final hours, or the killer, or the people in the theatre, but rather, through the lenses of those who sought to show the world how those events unfolded. Nicholas Pistor’s book Shooting Lincoln is a good book for those new to the study of Civil War photographers, and those who wish to look at the assassination in a way they may not have yet. Pistor’s book zooms in on the two most prominent photographers of the day: the famed Mathew Brady and his protégé turned rival Alexander Gardner. Shooting Lincoln totals just about 200 pages of narrative, and about half of that covers the careers of Brady and Gardner before April, 1865. Some may think that that is a little too much backstory, but the exposition certainly helps explain how and why Brady and Gardner were so intent on one-upping each other and getting the better photographs. Pistor’s early chapters discuss a great exhibition in London that seriously introduced the new study of photography, as well as the beginning of the war and Gardner’s famous excursions to Antietam and Gettysburg. Pistor’s work does not break much new ground—his bibliography is full entirely of secondary sources and easily accessible primary sources, with nothing represented from unpublished manuscripts. But the story is still told well, and Pistor brings alive the struggle between Brady and Gardner, plus other associates that have come down through history like Timothy O’Sullivan. The constant narrative thread is how Brady and Gardner consistently found themselves at odds—first, when Gardner worked for Brady yet received little to no credit for his work, and then to when they were rival photographers both looking for the best scoop. The best part of the book comes from the inclusion of plenty of photographs, which is paired with Pistor’s narrative. In that sense, one reads about the work done by Brady or Gardner to get the photo, and then they see the finished result amongst the page breaks. Through that purview, they become more than just downloaded scans from the Library of Congress, but now have full-fledged back stories to them. Pistor’s narrative goes through the battlefields of the Civil War, to the stage at Ford’s Theatre, the deck of the USS Montauk, and to the gallows at the Washington Arsenal. Shooting Lincoln is the ideal version of popular history—a story told well that is very accessible to newcomers who may be seeking an introduction to the major players surrounding photography and the Lincoln Assassination. What Pistor makes abundantly clear with his closing pages is that the advances in photography and innovations pushed by people like Brady and Gardner continue to help us today. Even amongst the modern hustle and bustle of constant news, it all comes back to the photographers who lugged their heavy equipment around, carefully treated their wet plates, and waited for the best shot. 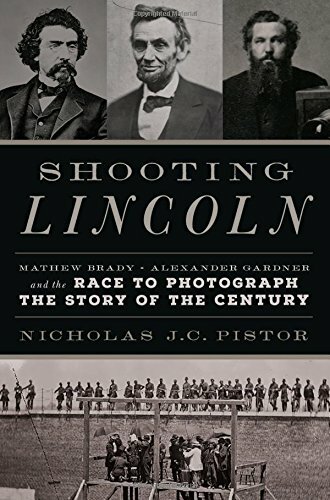 Nicholas Pistor, Shooting Lincoln: Mathew Brady, Alexander Gardner and the Race to Photograph the Story of the Century. 272 Pages, Endnotes, Bibliography, Index. This entry was posted in Book Review and tagged Alexander Gardner, Book Review, Da Capo Press, Lincoln Assassination, Mathew Brady, Nicholas Pistor, Photography, Shooting Lincoln, Timothy O'Sullivan. Bookmark the permalink. Off to amazonprime to make a purchase! Well done, all around.